Since the chair was in the closet beneath a pile of baskets and purses, I could hardly claim that I was using it so MIM couldn’t. I had frequent, good intentions of unearthing it. My excuse, and I’m sticking with it, is that it’s too low for my desk. Neither could I claim that he wouldn’t care for it properly, since I wasn’t doing that, either. So I let him dig it out and haul it happily off to the Barage. He promised to return it in mint condition. One of the bummers of having a child is that you have to drag your sorry okole out of bed early every day. No more sleeping in. Not that I was ever much of a late riser, but there’s a difference between getting out of bed because you want to and getting out of bed because you have to, which didn’t used to apply to weekends. One of the joys of having a child is finding yourself dragging your sorry okole out of bed to do things you’ve never done before. To embrace life! To taste new experiences! To rediscover the wondrous world we live in! 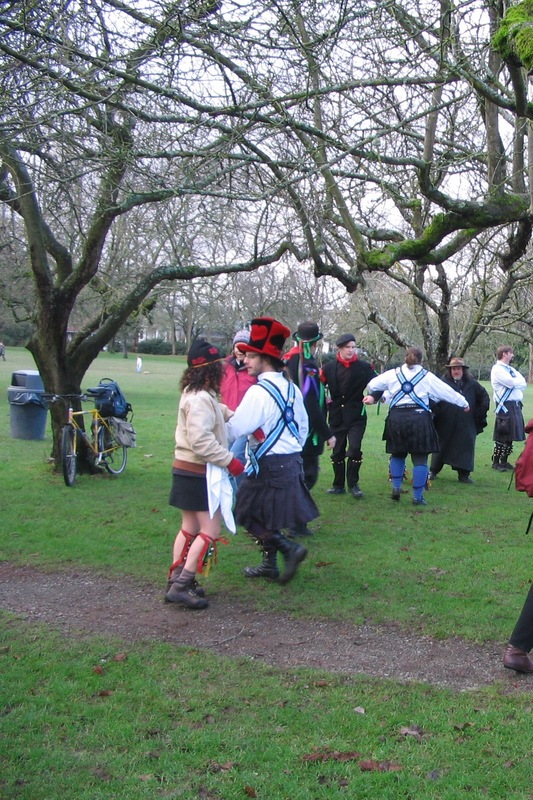 To, er…watch men in skirts dance around a tree in twenty-eight degree weather! Rather like a rapper’s “Wassup yo?”, Wassail can be translated as Good health to the apple trees so we can make more booze this year! 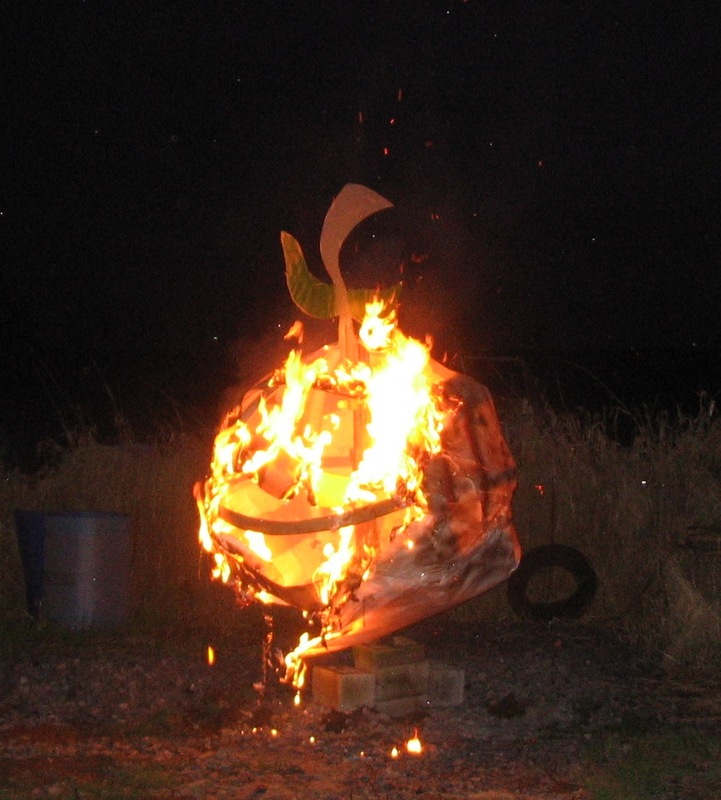 Wassail traditionally occurs on Epiphany, or the Twelfth Day of Christmas. This means early January. This means crappy weather. Not the ideal time to find yourself standing around out-of-doors. In the Pacific Northwest, mid-January might be somewhere around fifty degrees, with an approximately one hundred percent chance of rain. Tolerable with a decent umbrella and a hip flask. But this January brought us unusual, below-freezing temps. Still, once we’ve said we’re going, the Family with Integrity (as well as the Dad Obsessed with Cider) tramps to the Wassail no matter what. Donning scarf, hat, coat, and winter boots, this wahine whined less when I saw that most of the other attendees, including the men, wore short skirts over bare legs. 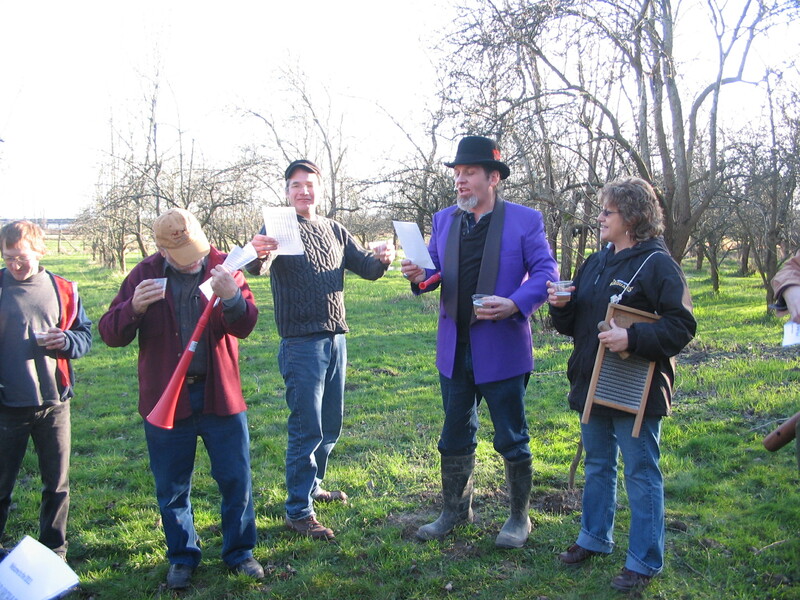 Some of the dancers and musicians had come all the way up from Portland just to serenade an ancient orchard in our small park, and a local troupe shared their cider and apple cake with the strangers who joined in. 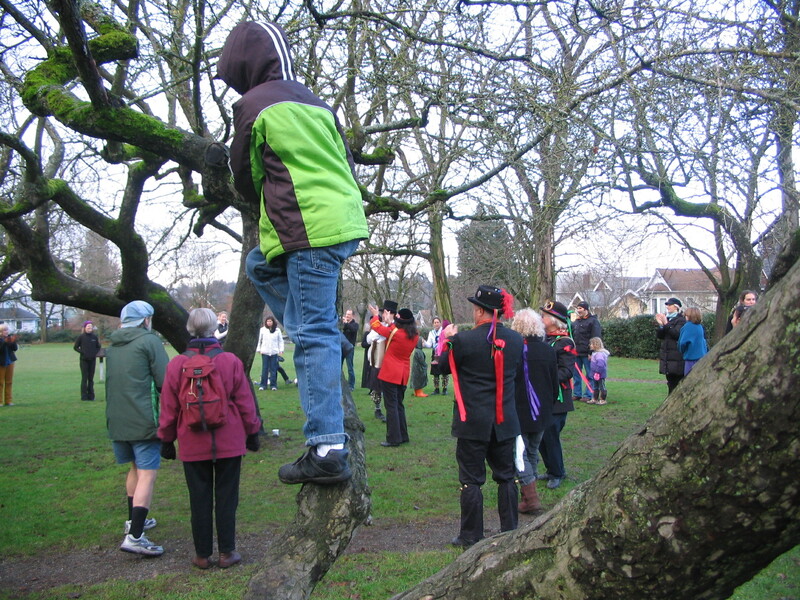 The Little Monster climbed a tree for a perfect view, and the celebrants and the ceremony were, of course, lovely (especially as I reminisced upon it afterwards over a beer and hot soup at a nearby pub, sitting near a heater). Considering that last year’s crop in our friend Mac’s pear orchard was absolutely zero, zip, nada (despite the pollinating bees who made it to the orchard by way of my salad drawer), MIM decided that a Wassail there was in order, post haste, although he refused to wear a skirt. 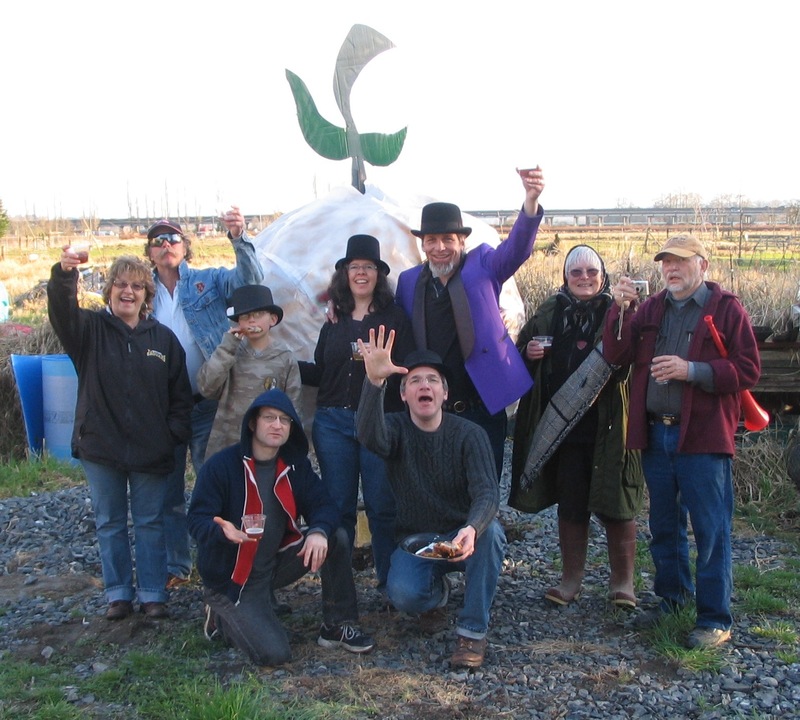 MIM’s not a “do it in moderation” kind of guy, so his Wassail would, quite naturally, include a big party, live music, and a huge, pear effigy to set aflame. After all, what’s a party without burning something down to the ground? In my book, one Wassail a year (or perhaps a lifetime) is quite enough, but I knew I’d have to go. With all that MIM does to encourage me and my daft dreams, I’d be a poor sport to refuse to stand in the cold, pouring rain in the middle of nowhere, pretending that I wouldn’t rather be doing something else. MIM spent weeks building the pear effigy. Around this time, he decided that 300 pear trees in the orchard weren’t enough, so he needed to plant some more. 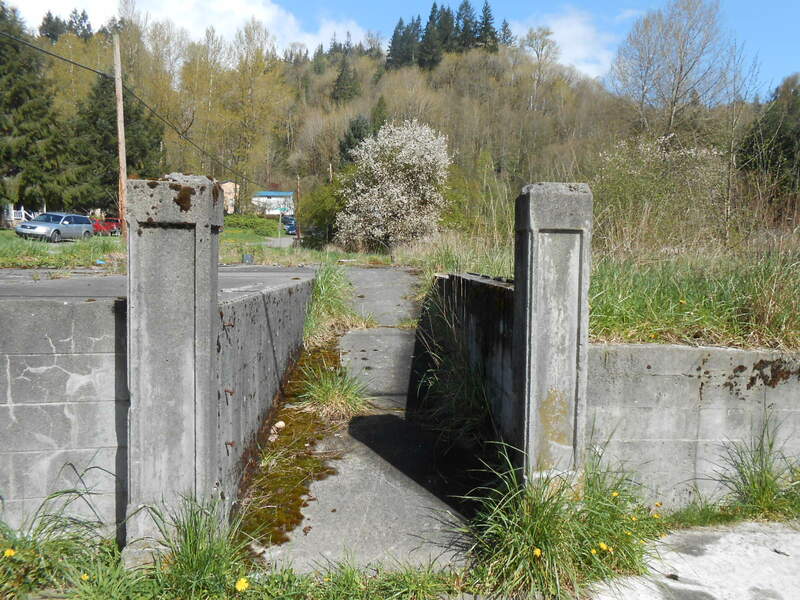 Washington trees just wouldn’t cut the mustard. He needed to buy “special” trees from Oregon. During a snow storm. While he had the flu. I also discovered that MIM and I have entirely different systems of math. The “six” trees he said he was buying somehow came to equal “40” trees. (Somehow MIM’s creative math only works with money going out, not coming in, although even I can figure out that 300 trees x 0 fruit gives the same answer as 340 trees x 0 fruit.) The new trees needed to be planted immediately, although, after the freeze, Mac’s pear orchard was now flooded. 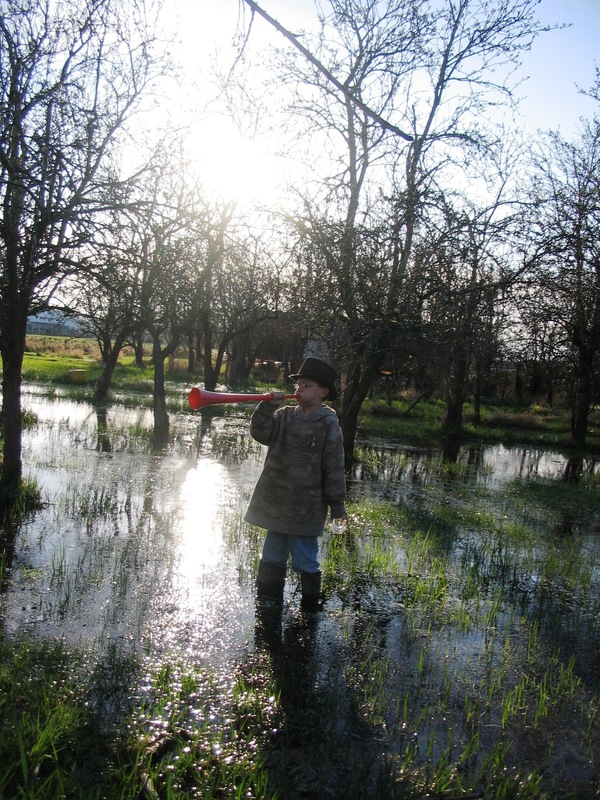 I’m no botanist or meteorologist, and I often don’t get the gist, but the flood seemed predictable, seeing as how the orchard’s located on a flood plain. Pretty handy in that you don’t have to worry about watering your new transplants. So, the Man I Married and the Little Monster spent a couple of weekends paddling around the orchard, trying to shovel out holes faster than the water could sink back into them. Because of the snow, and the flu, and the flood, and the trees that needed to be transported and planted, the January Wassail finally took place by pure coincidence on the spring solstice, on the night of the biggest moon in two decades. It also happened to be a sunny day under a blue, cloudless, sky. With little advance announcement, the big party and live music were scaled down to “whoever could make it on short notice” and “plastic horns and a wooden flute.” But the pear effigy remained monumental. 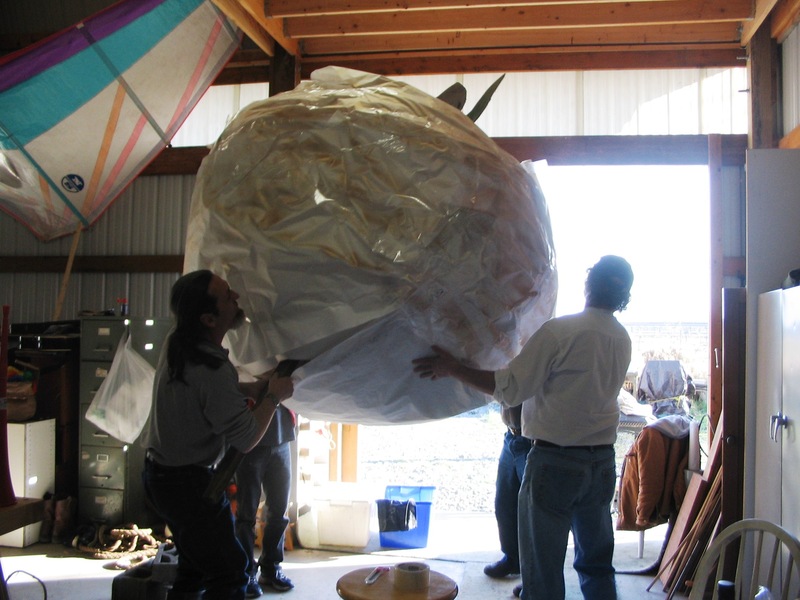 The day before the event, I asked the Little Monster about the pear effigy and how it was coming along. 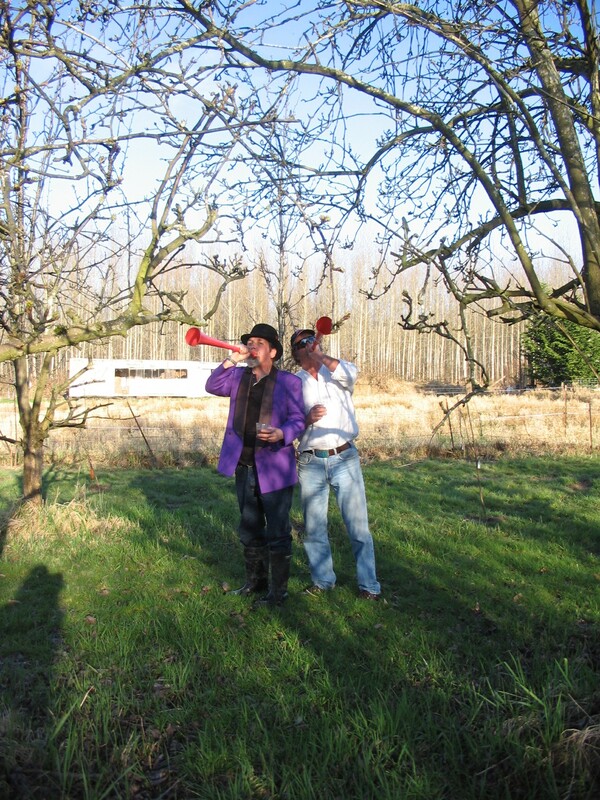 Like traditional Wassail ceremonies, MIM’s Wassail included making a lot of noise in the orchard, to scare away bad spirits. It also included singing Wassail songs to the trees, in order to promote a good harvest (although the way we sang, I think this part might be included in the “scare away bad spirits” portion of the program); the Wassail melodies are often identical to well-known Christmas carols. We toasted the trees with MIM’s surprisingly tasty, homemade, hard cider (first sip to the trees, the rest for ourselves, which ended up being quite a lot for me, on top of wine and whiskey). Then we literally “toasted” the trees by leaving bread in the branches to encourage the birds to return. And just before the moon rose, MIM and LM lit The Pear (after I had fussed and squawked all afternoon about being cautious and safe), which went up with colorful sparks owing to the pyrotechnics that Mac had hidden inside. And so the cold, wet day that I had dreaded came and went, turning out to be a perfect, life-affirming afternoon, with good friends, wonderful family, and my faith in humanity upheld. We thanked and appreciated nature, and she chose that day to play nice. The conversation sometimes turned to the natural and nuclear disasters in Japan and the upcoming bombing of Libya, but it would turn back just as quickly to how to keep MIM from setting himself and everyone else on fire and to debating whether to eat another piece of yummy fried chicken. We got out of the box that day. Without MIM and his eccentric visions, we might have all been on the couch, lamenting the world news, watching the moon rise through our dirty windows. 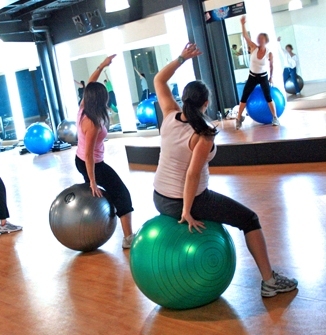 As I’ve long said, MIM’s more fun to watch (but not necessarily cheaper) than television. He’s gifted at uniting a variety of different people, which may include his initially-less-than-enthusiastic wife. Hand him North and South Korea and see what he’d accomplish. Even if our warbling song is out-of-tune and out-of-sync, at least we’re singing—to the trees, to the skies, to each other, to…the cows? Yes, the cows all came in from the far field to line up in a row and witness the revelry, and at the end of the day, at least we can say that they didn’t catch on fire (all that methane, you know). I applaud MIM’s decision to hold future Wassails on the spring solstice instead of on Epiphany. For me, recognizing the importance of sharing small moments with big-hearted people is all the Epiphany I need. Plus, it’s warmer. As always, our gratitude to Mac for sharing his heart and hearth, for his kind words of validation and encouragement, and for patiently humoring and appreciating the Man I Married. He has brought much joy to this newly-sprouted family.